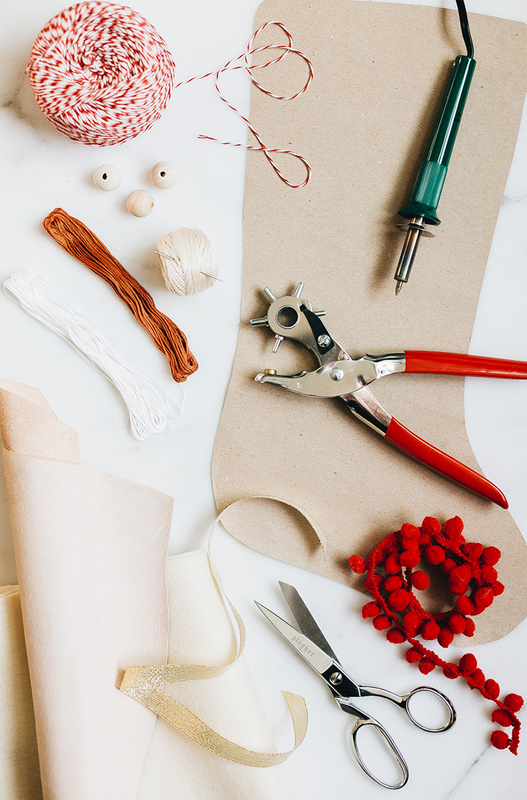 It’s sort of astounding how easy it is to make this leather stocking DIY. I know the pyrography pen can feel a bit intimidating to some, but —trust me— it’s way too fun. 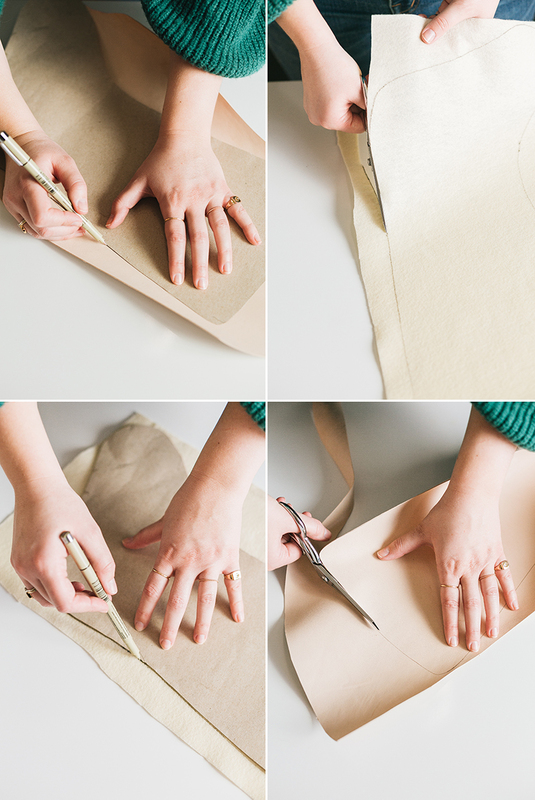 Grab a piece of scrap paper with which to make a template — an unfolded paper grocery bag works great for this! Trace an old stocking you have lying around on the paper and cut out the silhouette. If you don’t have a stocking laying around, just freehand a shape (it’s pretty simple and hard to mess up if you’re using a reference picture!). 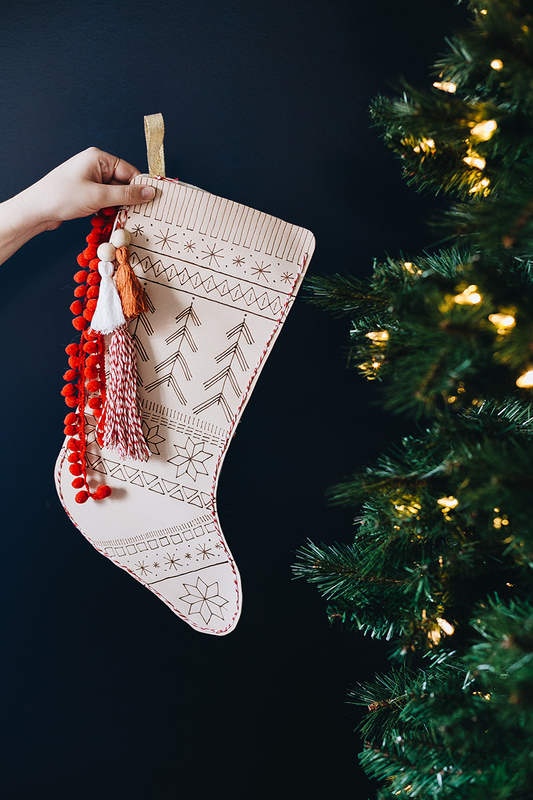 Once your template is ready to go, use it to trace the shape of your stocking onto the felt. Carefully cut out the felt. This will be the backing of our stocking. 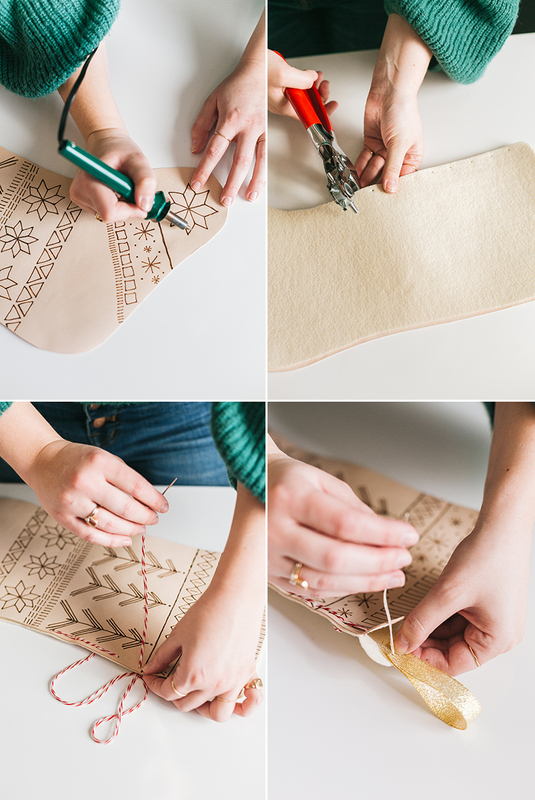 Repeat this process with the leather: trace the stencil and carefully cut out the shape. Plug in your pyrography pen and let it heat up. For this project, use the smallest round tip attachment. Once the pen is heated up, it’s time to start drawing! I made up the design as I went along for a more freeform look, but you can certainly trace the designs on with a pencil first if that’s more comfortable for you. Look for inspiration from vintage scarves and sweaters if you’re feeling stumped. I did some research online first to figure out the Fair Isle motifs I wanted to use, and I ended up going with different geometric patterns, Nordic trees, poinsettia-inspired flowers and little snowflakes. 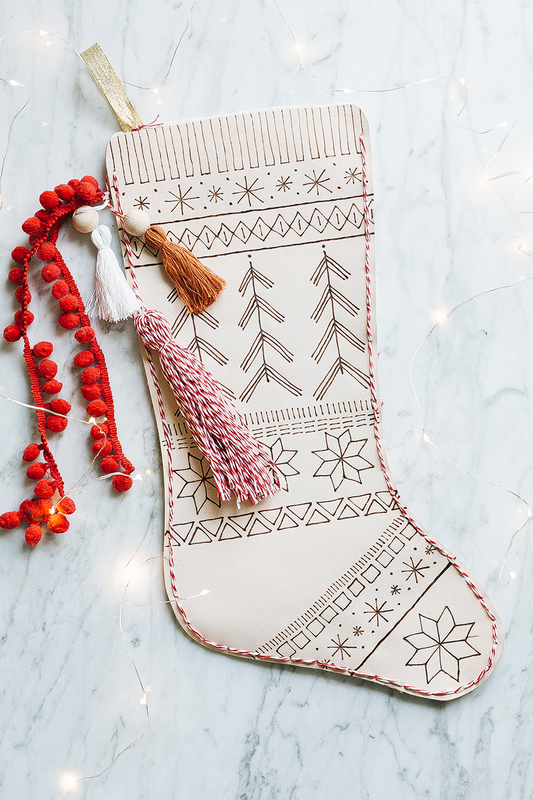 Once you’re done etching your pattern onto the leather, it’s time to assemble the stocking. Match the felt backing to the piece of leather and trim any bits that peek out from the back. While holding the two pieces together, punch small holes around the perimeter of the stocking, about 1/8″ from the edge and 1/2″ apart. Thread your large-eye needle with a length of baking twine and work your way around the stocking, using a simple back stitch. Don’t worry — it goes super quickly! 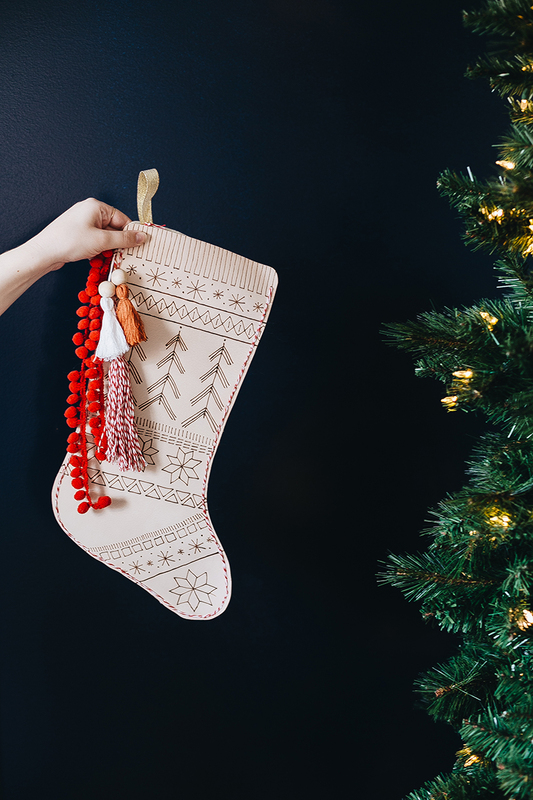 To create a little hook with which to hang the stocking, fold a piece of gold ribbon in half so it’s about 4″ long. Stitch the bottom of the loop into the corner of the felt and knot securely. 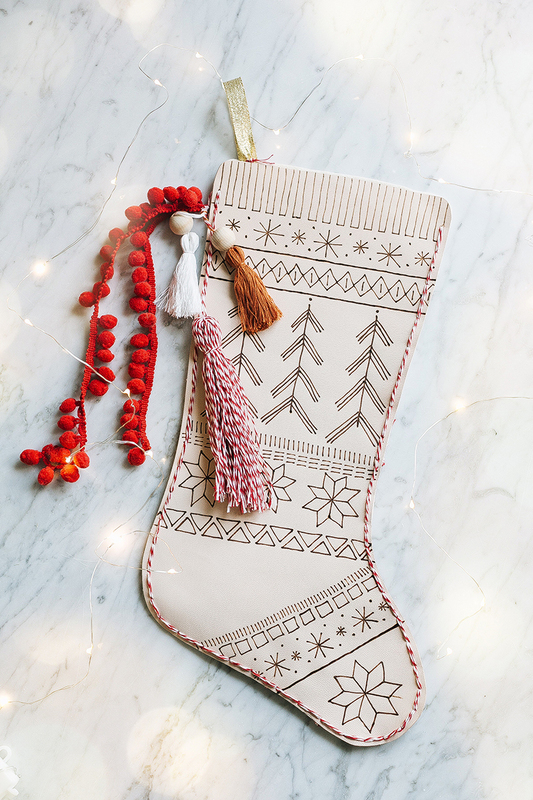 Now that our leather stocking is completely built, we can finish by making a few pretty embellishments. First, let’s make a few tassels. Cut a 12″ length of embroidery thread, then lay the rest of the thread over that length. Securely knot, then fold over the two ends of the thread and trim into a straight line. 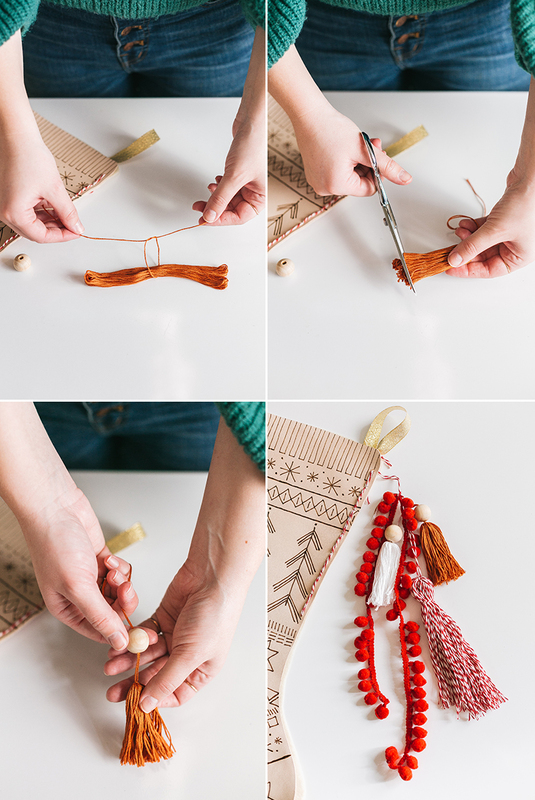 Add a wooden bead to the top of the tassel and knot again. For a fuller tassel, brush out the ends with a fine-tooth comb and trim again so you have a nice, straight bottom. Create a cluster of a few wood-bead tassels, a larger tassel made of baking twine, and some pretty pompom trim. Feel free to go crazy with this part! It’s a great way to add color and can be totally customized to coordinate with your holiday decor theme. And now they’re ready to hang! I love these pretty stocking hangers for the mantle, or you can display your stockings with a simple tack on the wall if you don’t have a fireplace. Happy decorating!